Resort holidays offer the ideal opportunity for a truly relaxing holiday break. No need to worry about dishes, cooking or cleaning as all is taken care of within the resort. The only thing you need to concern yourself with is, do you go back to the breakfast bar for a second helping of the buffet and when does the swim up pool bar open? Ahh...this is the life, the perfect opportunity to get away from it all, and being in the tropics only enhances that laid back experience. Resorts are designed to be convenient, and with that in mind you will find a large variety of on-site activities, facilities, and resort services to make your stay as simple and stress free as possible. Standard inclusions are a large tropical pool and onsite restaurant; in addition to this some resorts also offer a bar area, day spa, kids club, golf course, gym facilities, live entertainment, retail store and plenty other activities on offer. 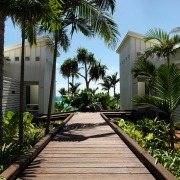 Rooms vary from a simple hotel suite to one, two, three and four bedroom apartments, penthouses and villas. Families will love resort holidays for the ease of having everything readily available onsite, and entertainment to keep the kids amused. Some resorts run a kid club during the school holiday, which allow parents to have some much needed relaxation time while the kids play. Couples will love the opportunity to pamper, and spend quality time with each other without any other distraction; and groups of friends will find the convenience of a resort holiday allows more time for fun and social occasions. 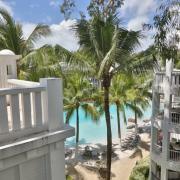 The Sheraton Mirage in Port Douglas is well known for its magnificent sparkling lagoons that extend over two hectares. 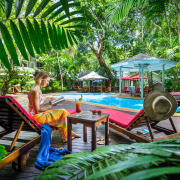 The resort is situated directly on Four Mile Beach and expands 130 hectares with tropical landscaped gardens, a championship 18-hole golf course, fitness centre, 4 restaurants & bars, kids club and resort shopping. This combines the very best of resort living. Whether you are on a romantic getaway or entertaining the entire family, there are superbly appointed guest rooms, suites and villas to suit. Paradise Palms Resort & Country Club is situated 20 minutes north of Cairns City and features one of the most picturesque 18 hole championship golf courses, along with an impressive Queenslander-style clubhouse, restaurant & bar, 2 resort swimming pools, games room, poolside cafe and the 'Pelicans in Paradise' adventure playground. 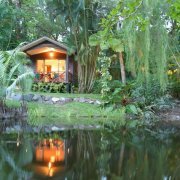 This is an idyllic choice for a tropical getaway. 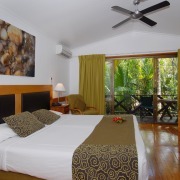 Rooms comprise of a standard resort room, one and two bedroom fully self contained apartments. 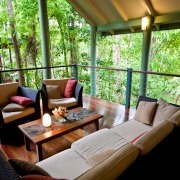 Sea Temple Resort & Spa is located beachfront at Palm Cove, offering guests a tranquil escape in luxury 5 star surrounds. This boutique resort has been designed with the utmost privacy in mind, featuring beautifully appointed 1, 2, 3 & 4 bedroom apartments and villas that are all set within lush gardens, and around the free-form grand lagoon pool. Resort facilities include a day spa, restaurant & bar, 3 swimming pools, fitness centre and direct beach access. 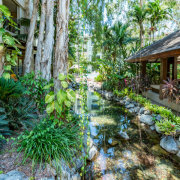 The Novotel Cairns Oasis Resort is centrally located in Cairns City, so you can enjoy the very best of resort living combined with easy access to all the city entertainment. Situated on 5 acres of tropical gardens, the Novotel Oasis has the largest lagoon style hotel pool in the City Centre. Other guest facilities include a restaurant & swim up pool bar, gymnasium, children's play area, massage & beauty studio and hair salon. The resort style atmosphere is fantastic for both couples and families, rooms comprise of standard resort rooms and suites that feature a larger living space with lounge area. Bedding is either a king or 2 x double beds. 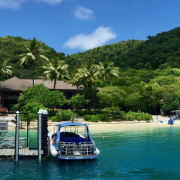 Castaways Resort & Spa is situated absolute beachfront on Mission Beach, this is one of the very few absolute beachfront spa resorts in Tropical North Queensland. 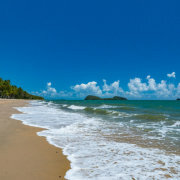 Mission Beach is located just 2 hours drive (150km) south from Cairns Airport and is a haven for rest and relaxation. 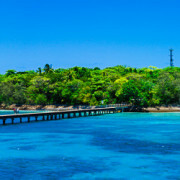 This beautiful little beachside town is surrounded by World Heritage Listed Rainforest and 14 kilometres of wide golden beach with the Great Barrier Reef and islands just beyond. Castaways offers a wide selection of room types to suit all budgets; from couples to families the range of suites, resort rooms, family rooms and apartments will suit all requirements. Facilities include a swimming pool & spa, restaurant & bar, library & games room, gym/fitness room and BBQ facilities.